We have partnered with over 350 businesses over the last 35 years. We are building a world where everyone has a decent place to live. Through our housing and sanitation programs we are able to create clean, safe and secure spaces for women, children and families in need of decent shelter. 88% of all funds raised are deployed towards program costs. We maximise use of your funds to help families in needs. For every rupee donated, we are able to leverage upto thirty eight rupees from government bodies. All efforts of Habitat India are supported by independently sourced funding. There is still a lot of work needing your support. 1 in 3 children drop out before elementary school because they don’t have a secure space to study or access to sanitation facilities. Building homes, and equipping schools with sanitation units helps children continue their education. The lack of decent sanitation facilities mean that women have to defecate in the open. They go early in the morning or wait till nightfall, in fear of being seen. Sexual assaults are common as they go to secluded places. Open defecation leads to the spread of illnesses and a higher mortality rate. Building and driving usage of these sanitation facilities build healthy and hygienic communities. We carry out a detailed assessment of the community and its members to better understand their needs, so we may build a home that matches their lifestyle. We are a specialised team collaborating with the government and implementation partners to have a wider reach. In the past 35 years, we have worked on over 33,982 projects across 26 states in India. Some of the largest and most diverse groups of people have come together to support us in making this happen. 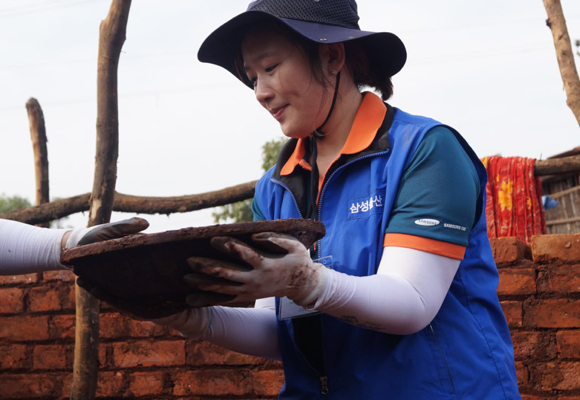 Our corporate volunteering program gives employees the opportunity to travel to parts of the country they wouldn’t have otherwise visited, and physically build homes with communities who come from a completely different background. It forges strong bonds with their peers, and enables them to make a visible difference to someone’s life. Schedule an introductory meeting with our CSR team.